People take part in pro-government rallies, Iran, Jan. 3, 2018. U.S. President Donald Trump promised new support for the Iranian people Wednesday, even as Iran's state media reported that tens of thousands of pro-government demonstrators staged rallies across the country after days of anti-government protests. "Such respect for the people of Iran as they try to take back their corrupt government," Trump said in a Twitter comment. "You will see great support from the United States at the appropriate time!" It was not immediately clear what assistance Trump had in mind. Iranian state television Wednesday showed video of crowds waving Iranian flags and chanting in support of Supreme Leader Ayatollah Ali Khamenei. Later in the day, Iran's Revolutionary Guards said the anti-government protests that erupted over the past few days were at an end. "Today we can announce the end of the 2018 sedition," Mohammad Ali Jafari, commander of the Revolutionary Guards, said on its website, adding that the number of protesters "did not exceed 15,000 people nationwide." He said the Guard had deployed limited numbers of troops in Isfahan, Larestan and Hamadan. Official and semi-official media offered no new reports of anti-regime protests, which have claimed 21 lives in the last week. Iranian President Hassan Rouhani expressed hope in a phone call with Turkish President Recep Tayyip Erdogan that the protests would end in a few days, a Turkish presidential source said. Khamenei has blamed other governments for driving the anti-government protests that began last Thursday. "In recent days, enemies of Iran used different tools, including cash, weapons, politics and intelligence apparatus to create troubles for the Islamic Republic." Khamenei said in a televised statement Tuesday. He added that he would address the nation about the protests "when the time is right." Ali Shamkhani, secretary of Iran's Supreme National Security Council, accused the United States, Britain and Saudi Arabia of being behind the protests. Trump has used several Twitter posts to express support for those protesting the Iranian government. "The people of Iran are finally acting against the brutal and corrupt Iranian regime," he posted Tuesday. "All of the money that President Obama so foolishly gave them went into terrorism and into their 'pockets.' The people have little food, big inflation and no human rights. The U.S. is watching!" After Trump's comments, the Iranian Foreign Ministry said, "Instead of wasting his time sending useless and insulting tweets regarding other countries, he would be better off seeing to the domestic issues of his own country, such as daily killings of dozens of people...and the existence of millions of homeless and hungry people." FILE - U.S. Secretary of State Rex Tillerson speaks during a high level Security Council meeting. 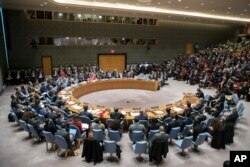 The United States is calling for the United Nations Security Council to hold an emergency session to discuss the Iranian protests. U.S. Ambassador to the U.N. Nikki Haley said the Iranian people "are crying out for freedom." U.S. National Security Adviser H.R. McMaster made similar comments in an interview Tuesday with VOA. "The Iranian people are expressing frustration, frustration about a regime that pays more attention to exporting terrorism than it does of meeting the needs of its own people," McMaster said. He also told VOA the Iranian government has to be held accountable for its actions. "It's important that this regime be denied the resources it needs to continue its murderous campaigns, and so its diplomacy, but it's also sanctions, and we see the Iranian people are expressing their displeasure about the nature of this regime how it treats them, but also how it treats the rest of the world," McMaster said. U.N. Secretary-General Antonio Guterres expressed his "regret" at the bloodshed in Iran, saying the U.N. expects "the rights to peaceful assembly and expression of the Iranian people will be respected." 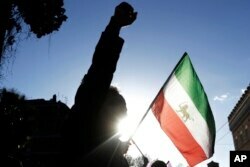 A demonstrator shouts slogans near the flag of the former Imperial State of Iran as he gathers with supporters of Maryam Rajavi, head of the Iranian opposition group National Council of Resistance, outside the Iran Embassy, in Rome, Jan. 2, 2017. Meanwhile, the U.S. State Department urged Iran to stop blocking online social media traffic in the country and said its citizens could set up virtual private networks to circumvent censorship. Since the protests erupted last week, Iran has curbed some social media services like Instagram and Telegram. Hundreds of demonstrators have been arrested since the protests began Thursday in Mashhad before spreading to other parts of the country. Deputy Interior Minister Hossein Zolfaghari said 90 percent of those detained were under the age of 25. Some analysts say it is an indication of their frustration at lack of social freedoms and economic conditions, including high unemployment and rising food prices. Shahram Akbarzedeh, a research professor at Australia's Deakin University, said Rouhani came to power with a mandate to revive Iran's economy, generate jobs and bring down inflation, and has largely failed to deliver. 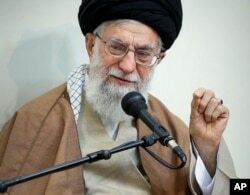 He also told VOA that Khamenei's comments are consistent with the government's practice of blaming outsiders. "It shifts the blame – our society is fine, our regime is fine, everyone is happy in Iran, and if it wasn’t for this external meddling there would be no issues whatsoever. That’s one thing. The second thing it does, it legitimizes the use of violence against protesters because if the regime is dealing with external saboteurs and not internal dissenters then it’s perfectly legitimate for Iran to use its security forces and clamp down on opposition," Akbarzedeh said.